Image received from AEP-006 during initial communications. Description: AEP-006 is a circular dimensional anomaly (approx. 3 meters in diameter) that resembles theoretical wormholes. AEP-006 provides access to an adjacent reality where the now defunct German Reich (further designated as AEP-006-1) managed to be victorious in World War II. AEP-006-1 was confirmed to achieve advanced technological progress. The current year within AEP-006 was discovered to be 20██ during initial communication. Upon initial enclosure, AEP-006 appeared within Site 628 seemingly intentionally in an area large enough for containment. After enclosure, multiple communications messages were intercepted, being confirmed to be various phone calls, songs, and radio frequencies. Multiple expeditions were undertaken with teams of 5 O-Class Personnel each to examine the reality AEP-006 connected to. All expeditions ended in success with no losses. First contact with AEP-006-1 was established on ██/██/20██ when multiple armed personnel from AEP-006-1 entered the enclosure via AEP-006. The following log contains initial contact established by Dr. ████. Dr. ████ and other personnel are interrupted by the sound of multiple armed personnel emerging from AEP-006. An individual wearing an officer uniform resembling that of a Wehrmacht officer's is seen emerging after the others. The Unidentified Officer is seen pulling out an English translation book and giving an audible cough. Officer ██████: On behalf of the Fuhrer and the Third Reich, I greet you all! We have… erm… noticed your recent incursions into our territory! And we wish to establish a peaceful and… reconciling communication with whomever you may align towards. The Officer chuckles as unarmed personnel emerge from AEP-006. The unarmed personnel holding what seems to be radiation equipment and testing the area before leaving. Officer ██████: I assure you, we are very understanding to your… erm… predicament? Yes, predicament. We already have personnel on the other end of our little portal here, constructing a site for us to maintain further contact. Now… while our appearance is quite sudden and shocking, we will have you know that this is simply just for you to know we mean no harm. Dr.████ and Officer ██████ approach and converse privately for 5 minutes. O-Class Personnel are escorted out by security as Dr. ████ and the Officer shake hands. Dr ████: I assume you're going to have better appointed meetings in the future? Officer ██████: Of course, look at this as both of us planting the seeds for future cooperation between our organizations. Following successful contact, the individuals from AEP-006-1 return via AEP-006. Communications are established via radio shortly after. Following initial contact AEP-006-1's Administration has been highly cooperative with the Association. Allowing the exchange of personnel and information between Site-682 and Site-782. Addendum 1A: AEP-006-1 personnel notified Site-628 Personnel on ██/██/20██ that the "Führer" (further Designated as AEP-006-2) is to communicate with Site 628's Director █████. Multiple security personnel from AEP-006-1 were dispatched days before communication was planned. On ██/██/20██, AEP-006-2 made contact with Site 628's Director. AEP-006-2 refused to document the event, but allowed notes to be taken of the meeting. Director █████: Upon meeting AEP-006-2, I noticed a striking resemblance to… erm… Adolf Hitler. Appearance, voice, height, all seemed to fit the profile for him. Which was the oddest part of the whole meeting. After asking AEP-006-2 of their origin, they explained that they were indeed a clone of sorts of the long dead Fuhrer. Director █████ pauses to take a drink of water. Director █████: Although AEP-006-2 did more or less confirm cloning to be their origin, they did not explicitly state it. It appears that AEP-006-2 has the memories of the former Adolf Hitler, and assumed the identity of him. Besides the oddity of the initial meeting, we managed to get information regarding AEP-006-2's reality. Director █████ proceeds to open a folder containing further notes. 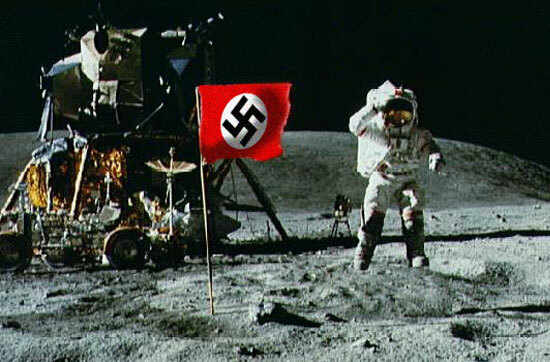 Director █████: Upon further interview, AEP-006-2 confirmed that the moon landing picture was indeed real and was taken during the first moon landing on ██/██/195█, detailing immense technological progression following German victory in World War 2. AEP-006-2 seemed prideful of technological progress achieved by AEP-006-2 and went further to detail of colonial settlements on the planets of Mars and Venus in the year of 198█. Unfortunately, AEP-006-2 refused to answer further questions regarding the technological advancements of AEP-006-1. Short pause as Dr. ████ hands Director █████ further documentation. Director █████: The final questions comprised of the state of AEP-006-1 and the world in its reality. AEP-006-2 confirmed that the world was mostly subjugated by German forces following World War II, going so far as the United States and multiple nations in the Americas, Asia, and Europe to be "client states of the Reich". After this was confirmed, AEP-006-2 thanked us for the opportunity to ask questions and announced their departure. No further meetings have been scheduled as of recent. Addendum 1B: Further cooperative actions have been approved by AEP-006-1 following the meeting between AEP-006-2 and Site 628 Director █████. Cultural and technological exchange is now approved to take place yearly between Site-782 and Site-628. Further guard detail from AEP-006-1 has been added. Addendum 2A: During a routine O-Class Exchange with AEP-006-1, O-6897 attempted to flee and defect to AEP-006-1. No further events have been recorded with O-Class Personnel fleeing. AEP-006-1 personnel have remained silent about the status of O-6897. Addendum 2B: AEP-006-1 Personnel have released information regarding O-006-1, detailing that once apprehended O-6789 was found to have partial Ashkenazi heritage. Documents show that O-6789 was terminated by AEP-006-1 personnel following capture of O-6897. Following the release of information, Site-782 submitted a request to Site 628 for all O-Class exchanged to be of Ashkenazi, Sephardi, Israeli, and Various African ancestries. The request was partially granted on the condition that non specified subjects would make up 2 of 5 exchanged O-Class Personnel. Maintenance Protocols: AEP-006 requires a constant 5 megawatt charge to maintain contact with AEP-006-1. AEP-006 can be maintained indefinitely without this charge, but at the cost of contact with AEP-006-1. AEP-006 is enclosed in a 15.5³ m room at Site 628 (located near █████████, Germany). Members of AEP-006-1 are scheduled to make contact at approximately 7:00 GMT+2 to 12:00 GMT+2 bi-weekly (every two weeks). Technological and cultural exchanges are permitted after proper filing and documentation. AEP-006-1 Security Personnel and Site personnel are to cooperate in the security of both Site-628 and AEP-006-1's Site-782. During communication with any individual from AEP-006-1: the falsehood of a German Victory in World War II in this reality must be upheld. All maintenance equipment for AEP-006 must be in an adjacent room to protect against possible malfunction. Value Assessment: Communication with AEP-006-01 has been extremely profitable for the Association and further trades would be highly beneficial considering how far ahead AEP-006-01 is.